The summer months are quickly approaching which means roadtripping season in Canada is just around the corner! Atlantic Canada is a popular destination for roadtripping enthusiasts, with New Brunswick, Prince Edward Island, and Nova Scotia being relatively close to one another. And if you’re really adventurous, you won’t miss out on exploring Newfoundland and Labrador either. New Brunswick has a lot to offer visitors and is like a mini-Canada all in one province. You’ve got mountains and flatlands, freshwater and saltwater, lush forests and vibrant city centres, and of course French and English. Whether you’re packing up your car, renting an RV, staying in campsites, or a combination of camping and hotels/ B&B’s, New Brunswick is a great roadtripping destination. The tourism board has even made planning easy by creating 5 colour-coded routes you can follow. But to get the most out of the province, you’ll need around 2-weeks to fully take it in. 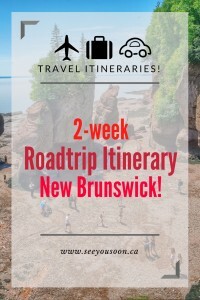 Below is a 2-week roadtrip itinerary of New Brunswick that includes all 5 of these scenic routes and spans the entire province. So let’s get going! The 5 scenic drives found within New Brunswick. Start your 2-week roadtrip of New Brunswick in Mount Carleton Provincial Park, located in the northwest part of the province in the Appalachian Range. Mount Carleton Provincial Park is all about hiking, portaging, nature, and as a designated Dark Sky Preserve, star-gazing. Hiking is the real draw here, with 11 trails to choose from including a brand-new portage trail connecting Bathurst and Nictau lakes which opened in the summer of 2016. There is no real cell-service, except as a reward for climbing one of the peaks, so this truly is the place to go to unplug and get back to nature. Depending on your arrival time to the park the day before, you may have already been able to explore parts of Mount Carleton Provincial Park and even take in a hike or two. But after a full night’s rest, today’s the day to take on one of the two peaks in the park – Mount Carleton or Mount Sagamook. At 820m (2,690 ft), Mount Carleton is the highest peak in the Maritimes and will take you about 5hrs up and down. The climb is gradual and not too steep, and rates as ‘moderate to challenging’ on the difficulty level. Mount Sagamook (777m/2,549 ft) is definitely the more challenging climb. It is a steep and steady climb that may be shorter, but will take you just as long (5hr) due to the slower pace it takes to climb it. But rest assured it is worth it as Sagamook boasts the best and most picturesque views of the area. Restigouche Sam in Campbellton, New Brunswick. It’s an early start today as you’ll need to pack up camp and hit the road for a bit of driving. Travel north along the Appalachian Range Route and admire the rugged terrain. After driving for about 2-hours, stop into Campbellton, a coastal city on New Brunswick’s northern shores known for salmon fishing. So much so, the city has erected an 8.5m salmon statue, apparently the largest in the world, named Restigouche Sam. Get a photo opt with Sam, grab some lunch, and then continue your drive east towards Bathurst along the Acadian Coastal Drive. The drive is quite lovely and you’ll start to see Acadian Flags dot the roadside as you enter into the Acadian region of the province. It’s worth exploring some of the coastal paths around Bathurst, especially with a cone of Northumberland ice cream in hand! After spending the night in Bathurst, continue your way east along the Acadian Coastal Drive towards the Acadian Historical Village. As Canada’s only official bilingual province, New Brunswick is steeped in Acadian history and there’s no better place to learn about this history than at the Acadian Historical Village. Here, visitors can explore this living museum, dedicated to showcasing the life of the Acadians during the 1800s and 1900s. The village is comprised of original houses and buildings dating as far back as 1770. Inside each of the buildings are interpreters, dressed from the time period, and carrying out traditional duties. Grab a traditional meal for lunch that typically would have been served during this time period and plan to spend at least 4 hours here. This is a wonderful experience that the entire family will enjoy. After your visit to the Acadian Historical Village, make your way around the Acadian Peninsula and then head south to Miramichi for the night. Located right at the mouth of the Miramichi River where it meets the Gulf of the St. Lawrence, Mirachimi is a charming little city known for its festivals and abundance of outdoor activities. Most activities centre around the Miramichi River, including stand-up paddle boarding, canoeing, kayaking, river tubbing, and even white-water rafting. But the Miramichi River’s biggest draw is salmon fishing. It’s some of the best salmon fishing in the world and has attracted the likes of Tom Cruise and even Prince Charles. In the city of Miramichi itself, it’s worth checking out French Fort Cove Nature Park, which used to be home to an old quarry that provided stones for part of the parliament building in Ottawa. Cap your day off with a nice stroll along Ritchie Wharf. The Bill Thorpe Walking Bridge in Fredericton. It’s time to say goodbye to the northern half of New Brunswick! Follow the Miramichi River Route as it cuts down into the centre of New Brunswick, coming to a head in Fredericton. As the province’s capital city, no roadtrip to New Brunswick would be complete without stopping in to visit Fredericton. Located on the banks of the Saint John River, the city has a small-town feel but offers a lot of outdoor fun. Check into the Delta Fredericton for two nights, relax for the rest of the day and take in the beautiful sunset from the hotel pool. It’s a full day in Fredericton, so fuel up at breakfast and let’s hit the town! The city is all about nature and being outdoors, so wear comfortable shoes for the day. Some things to check out: take a stroll across the Bill Thorpe Walking Bridge, the longest pedestrian bridge in the world that has been converted from a railway track; visit the Historic Garrison District and even participate in the changing of the guards’ ceremony; and try your hand at stand-up paddle boarding on the Saint John River with Second Nature Outdoors (they also rent kayaks and canoes if you’re more comfortable using those). If you’re into craft beer, you have to stop into Picaroons. It was founded in the city and features traditional style British Ales, a perfect way to cap off a full day in Fredericton. Insiders Tip: out-of-province visitors can get 3-days of free parking in the city. Visit the Fredericton Tourism Office to get your pass. This morning, head south to Saint John, Canada’s oldest incorporated city. Known in the past as an industrial town, Saint John has transformed itself into a historically hip port town that has great food, great beer, and picturesque brick buildings that make you want to explore. Located right on the shores of the Bay of Fundy, visitors can explore the historic streets centered in uptown Saint John (note, there is no ‘downtown’). Be sure to also wander the aisles at the City Market, the oldest continuing farmers market in Canada, and marvel at the Reversing Falls, a natural phenomenon where it appears that the river is flowing backwards. I highly recommend a stay at the Homeport B&B (say hi to Ralph for us!) and dinner at the Saint John Alehouse. Boats sitting on the ocean floor during low tide in St. Martins. It’s a full day today as you’ll explore the Bay of Fundy area. Follow the Fundy Coastal Drive east to St. Martins and stretch your legs at the St. Martin Sea Caves. The Bay of Fundy sees the greatest tidal shift in the world (changing anywhere between 11-16 metres twice a day). When the tide is low, you can explore the sea caves that are otherwise filled with water. It’s also rather funny seeing all the boats sitting slightly askew on the ocean floor. Before leaving the St. Martin Sea Caves, grab some lunch at one of the two restaurants on the waterfront. They each boast the best clam chowder. I really couldn’t tell you which one is better. After lunch, explore The Fundy Trail, a multi-use trail system that runs along the Bay of Fundy. Here you can drive or cycle the 19km paved roadway as it weaves its way along the towering Fundy cliffs. Alternatively, you can hike the 10km of coastal pathways that take you right down to the ocean floor during low tide. Stop to walk across the 84-metre suspension bridge crossing the Big Salmon River, climb down a cable ladder and check out the 15-metre high Fuller Falls, and pull over at the many observation lookouts to take in the incredible landscape. Guided walking tours are available or you can go it alone and explore the Fundy Trail at your own pace. Give yourself about 3-4 hours to explore The Fundy Trail then make your way to Fundy National Park where you’ll spend the night. After the full day yesterday, you may want to have a leisurely morning and slowly get your day started. Or maybe you’re still going strong and ready to hit some trails! Located right on the shores of the Bay of Fundy, Fundy National Park boasts 100 kilometres of hiking and biking trails through 206 square kilometres of Acadian forest. Visitors can come face to face with thundering waterfalls, freshwater lakes and scenic river valleys. For something light and easy, check out Dickson Falls. It’s the most accessible trail in the park and is comprised of many small waterfalls. The trail takes you down into a valley which, on a hot summer’s day, is a welcome reprieve from the heat. If you’re up for something more challenging, hike the 3-hr trail to Third Vault Falls, the highest waterfall in Fundy National Park topping out at 16 metres. The trail takes you through a mystical emerald green forest valley and was the highlight of our time in Fundy National Park. Cape Enrage during low tide. Looking to add a bit of adrenaline pumping adventure to your New Brunswick roadtrip? Then head south to Cape Enrage. Located about a 30-minute drive from the Alma entrance of Fundy National Park, Cape Enrage sits on towering, rocky cliffs that jut out into the Bay of Fundy. From the jagged cliff tops, you get a 270-degree view of the impressive Bay of Fundy below. It’s one of the most dangerous spots in the upper section of the Bay of Fundy as currents and winds move in opposite directions resulting in many shipwrecks over the past 100 years. To help minimize these shipwrecks, Cape Enrage has been the location of a lighthouse and fog alarm since 1838. The current lighthouse is over 140 years old and is one of the original 12 lighthouses built in the province. The view and lighthouse are worth the visit alone (say hi to Sharon in the Interpretive Centre. She’s a fountain of knowledge and just a wonderful person!). But here you can also try your hand at ziplining and repelling. The zipline cable stretches for 600m right over the main area of Cape Enrage, while the repelling is done along the 142-feet high rock cliffs. Both activities are a rush of adrenaline and a unique way to experience the area. After you’re done at Cape Enrage, head back to your site at Fundy National Park and rest up. Another big day awaits tomorrow! It’s another jam-packed day, so get up early, pack up camp, and head out to Hopewell Rocks Provincial Park. The Hopewell Rocks are one of the most visited sites in the Maritime Provinces. Visitors from across Canada and around the globe come here to witness the greatest tidal shift in the world. Twice each day, 160 billion tonnes of seawater flow in and out of the Bay of Fundy creating tidal shifts as high as 11 to 16 metres. During low tide, you can walk right on the ocean floor and admire the flowerpot rocks, the most iconic features of the Bay of Fundy. You’ll have about 6 hours to explore the beach area before high tide rolls in. And once it does, take a kayaking tour with Baymount Outdoor Adventures and explore the exact spots you were just standing in earlier and get a different perspective of the landscape. Check out this post for great tips for visiting Hopewell Rocks Provincial Park so you can get the most out of your visit. Once you’re done at the park, head north to Moncton where you’ll stay the night. Moncton is the province’s most populated city and due to its central position in the Maritime provinces, has developed into a significant hub for the surrounding area. There are a number of things you can do here in the city including wandering the streets and admiring the colourful street art, experiencing your car rolling backwards up Magnetic Hill while it’s in neutral (good for a laugh), sip wines made from fruits other than grapes at the Magnetic Hill Winery, or check out the various museums and galleries in the city centre. Cap off the day with a lobster dinner. Head out to Shediac Bay, about a 30-minute drive east of Moncton, and hop on a lobster-themed cruise with Shediac Bay Cruises. For 2-1/2 hours, you’ll cruise around Shediac Bay and learn about the lobster industry in New Brunswick; how lobster traps work, how to perfectly cook a lobster (note, it should always be served belly up to preserve the juices in the shell), plus how to properly shell a lobster. But of course, the best part is the lobster dinner itself – a whole lobster served with maritime-style potato salad and coleslaw. It doesn’t get any fresher than this! Time flies when you’re having fun, and just like that, your 2-week roadtrip of New Brunswick has come to an end! If you’re planning to continue exploring Atlantic Canada, Moncton is a great jumping off point for either Prince Edward Island or Nova Scotia. But if you want to stay within New Brunswick and have a bit more time, consider also checking out the eastern coast north of Moncton or the area just west of Saint John including Saint Andrews and Grand Manan Island.